hick bony plates armor the domelike back of this quadrupedal dinosaur, its powerfully muscled tail ending in a bony club. The ankylosaurus’s tail can deliver a powerful, stunning blow. A creature struck by this attack must make a DC 23 Fortitude save or be dazed for 1 round. If the strike is a critical hit and the target fails its save, it is instead stunned for 1d4 rounds. The save DC is Strength-based. 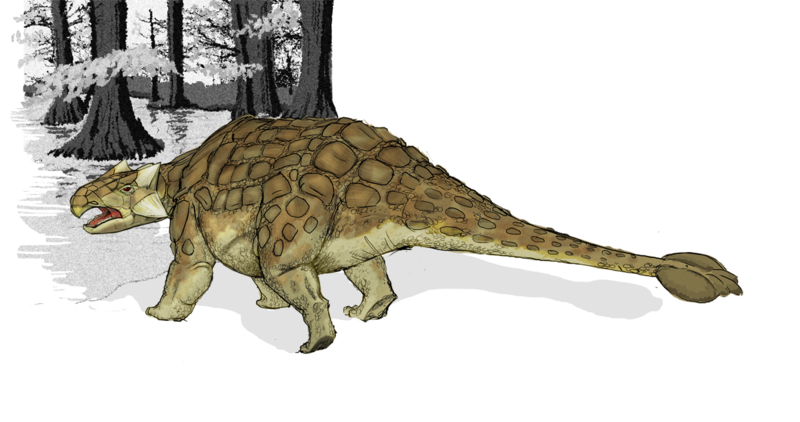 The ankylosaurus is a powerful, squat dinosaur more than capable of defending itself against enemies. Its back is heavily armored with thick bony plates and spikes. A solid blow from an ankylosaurus’s tail can leave most creatures stunned long enough for the armored dinosaur to make good an escape, although once confronted, most ankylosauruses are too ill-tempered and stubborn to flee. Instead, they stand their ground and use their tails to great effect in battle. An ankylosaurus is 30 feet long and weighs 6,000 pounds.